Our nine year old vacuum cleaner! Like so many Filipinas, I grew up not having to do any household chore. We had helpers who took care of those things, but I wouldn’t let them touch my room. It was always like a “pigsty”, my mother would say. Not knowing how to do household chores is something I am not proud of. I had to learn how to clean when I came here. Luckily, my husband didn’t complain that I was inutile at home. He patiently did the chores and it made me feel guilty that he had to work during the day and work some more at home! We didn’t have a vacuum cleaner at that time. It was his younger sister, my sister-in-law, who got us one sometime in October 2003. That was nine years ago! The vacuum cleaner my sister-in-law got us is a Samsung 550 watt. The built is plastic and only the tube is metal. It has an attachment for cleaning smaller areas. It is heavy, bulky and noisy but I love it as it has helped me a lot during the past nine years! House cleaning could be so tedious and laborious when you don’t own a vacuum cleaner. 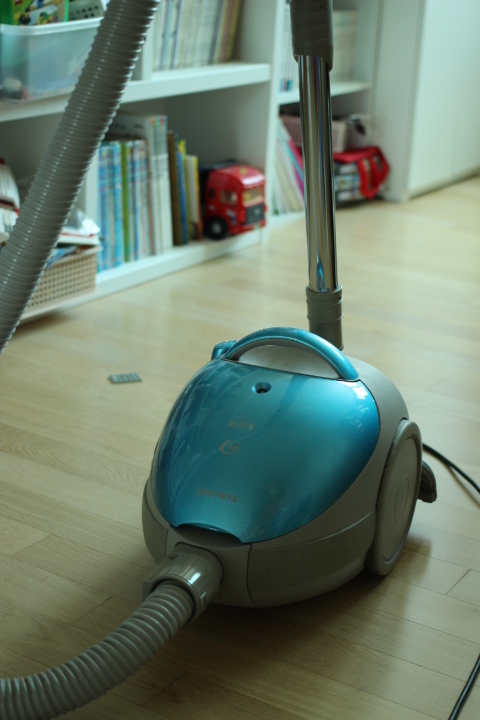 Dusts on carpets are quite difficult to clean up, if you would just sweep it with a broom. That’s why it is highly advisable to purchase a vacuum cleaner to thoroughly clean the corners of your home. 🙂 Thank you for the blog!